I’ve turned 30 since my last post. And while I’m not one for big birthdays, this one was well celebrated. Cooking dinner and eating in with girlfriends, pizza-movie-couch night with Matt, lunch with Mom, brownies, pancakes and a chocolate cake all to myself. I was very well fed. I received a message from an old friend the other day, saying that she was moving to Australia and getting married in the fall. I was overcome with joy for her even though it’s been years since we’ve seen each other. She went on the say that a lot had changed for her in the past 6 months, but that’s how her life has always been and she loved it that way. As I read her words, I noticed myself nodding my head in understanding. We have started packing up our things once again, and soon we will be packing up the car and driving west to Revelstoke, BC. We don’t have everything figured out just yet, but I know we will have a roof over our head and a few leads on jobs when we arrive. I’ve already pre-ordered 5lbs of asparagus from a local farm so at least we will have something fresh and green to eat as well. A lot can happen in life when you are open to possibilities. This blog here has seen a few different kitchens in its time, and while our little montreal home has had its ups and downs, I know that it has been the perfect place for our transition. To leave knowing that we have made the most out of our time here and to have so many new adventures to look forward to. So – ok 30, I think we’re going to have a good year you and me. I remember watching Jamie Oliver Shows on the food network way back when and always hearing him say that you should never taste a salad dressing with your finger tip, but rather use a piece of lettuce or salad ingredient to get the full flavor effect. It was just good simple advice that made sense and has always stuck with me. 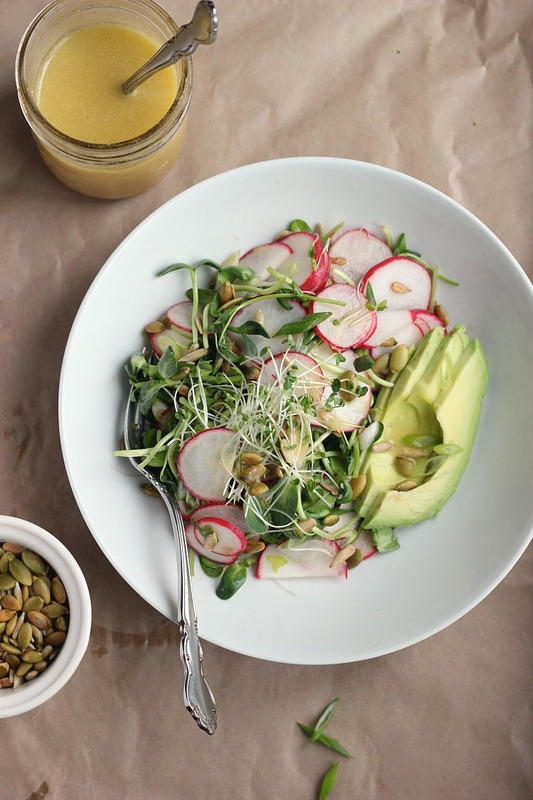 At first I thought that the lemon juice in the dressing was too overpowering, but it really cuts through the richness of the miso and pairs well with the fresh, crunchy radishes. It’s a simple spring bowl that works. Add brown rice or quinoa or both here to make it a fuller meal. 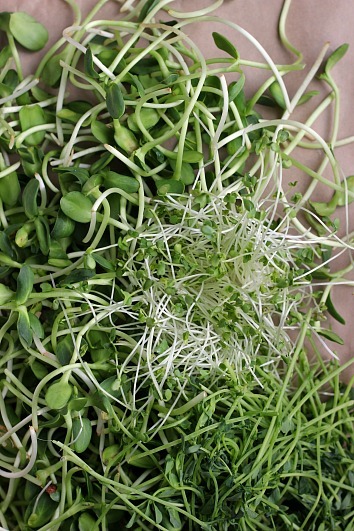 Sprouted mung beans or chickpeas if you want some extra protein. Lamb’s lettuce or spring leaves would turn this into a bigger side salad. Really, this is just the start. Serves 2. Vegan + Gluten Free. 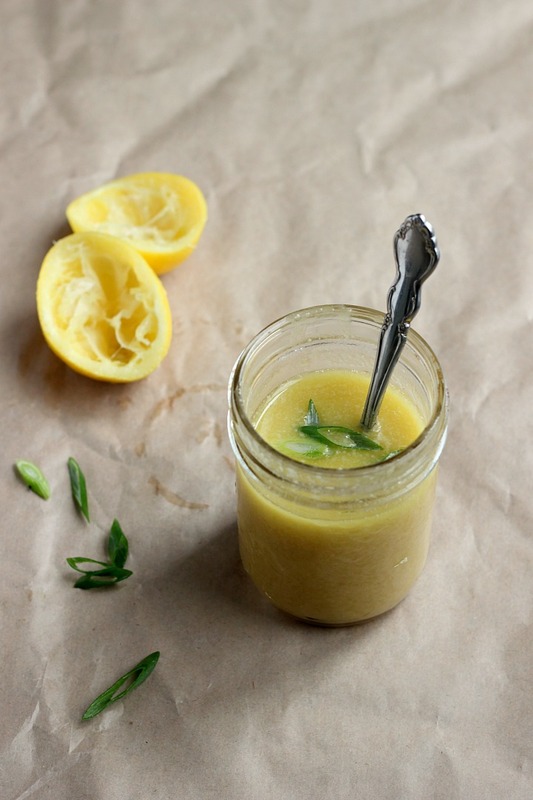 Make the dressing. Place all ingredients in a small blender and blend until thick and smooth. Add water as desired. Taste and adjust sweetness if necessary. Optional to stir in thinly sliced green at the end for color. 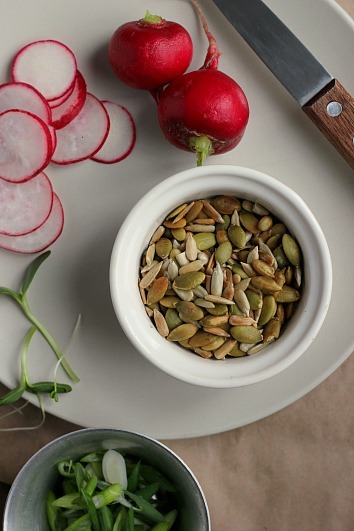 Add pumpkin and sunflower seeds to a skillet over medium heat and toast until fragrant. Seeds will start to crack and pop as they toast, stir often to avoid burning. 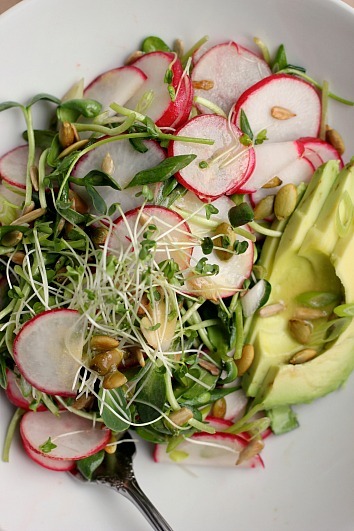 Place sprouts, radishes, green onion, and half the toasted seeds and mix gently with your fingertips to combine. Drizzle in a bit of dressing and gently toss. 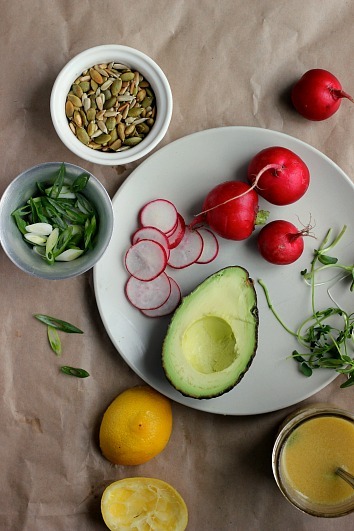 Divide into two bowls and top with sliced avocado. 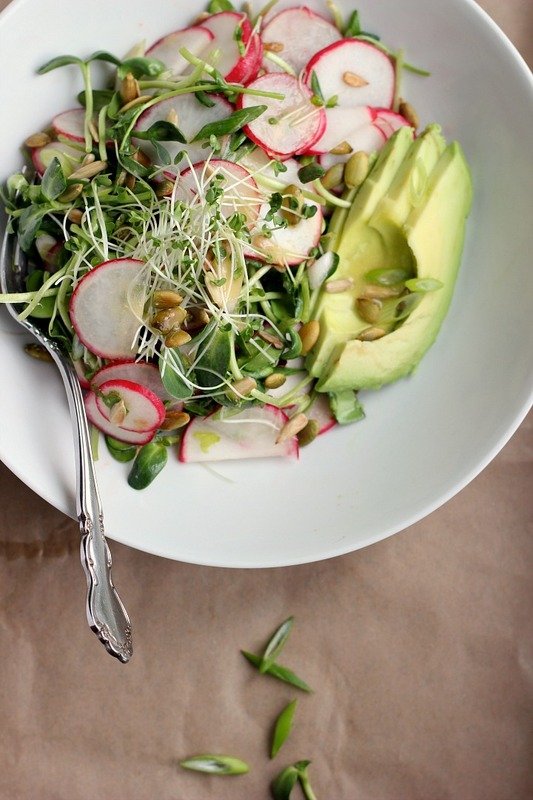 Serve with extra dressing and seeds. What a yummy spring salad! Jodi! Happy belated birthday you beautiful, adventurous girl. I am so happy for you I could scream right now. I love you and Matt’s adventurous hearts and focus on what really matters. So incredibly excited for you two and this move! Eee! Jodi! This is going to be amazing. (Ps. 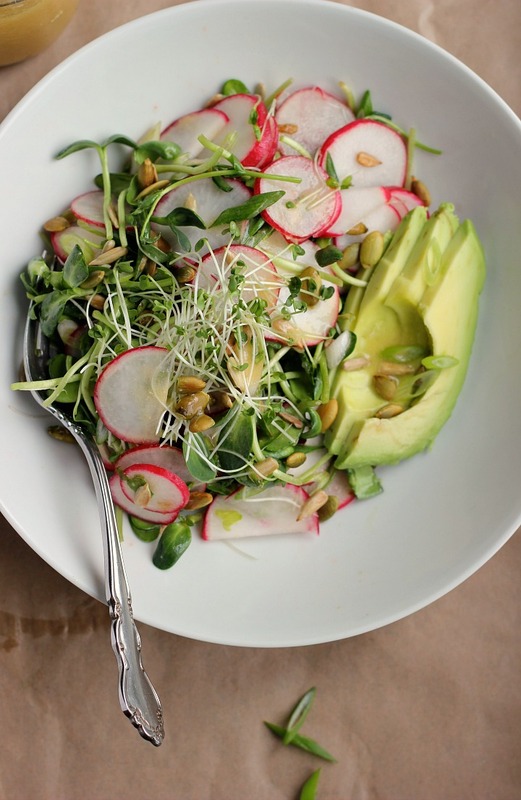 And this salad = everything I love too).